Grind the area where the curb will go to bare concrete – www.epoxy.com/surfaceprep.aspx. Drill holes into the concrete and fasten #4 bar into the concrete with Epoxy.com Product #2006 – www.epoxy.com/2006.aspx – Gel Adhesive. Allow Epoxy to cure overnight. Form the area to receive concrete curb. Coat the floor area in the bottom of the forms to receive the concrete for the curb with Epoxy.com Product #2007 – https://www.epoxy.com/Epoxy_Fresh_Concrete_to_Hardened_Concrete_2007.aspx – Wet to dry concrete adhesive. Pour your concrete before the #2007 becomes tack free. That will make it as if the curb and the concrete floor had been poured at the same time. An alternate method to this is to install concrete brick around the area bonding in place with Product #2006. This will help to reduce waiting for the concrete to cure if you use the poured concrete method above. Allow the concrete to cure – www.epoxy.comsurfaceprep.aspx. Cove the inside of the containment curb with Epoxy.com Product #720 – https://www.epoxy.com/720.aspx – coving resin allow to cure overnight. Prime the inside of the containment area with Epoxy.com Product #12– www.epoxy.com/12.aspx – Chemical Resistant Primer, and allow to cure overnight. Install 2 coats of Epoxy.com Product #633 – www.epoxy.com/633.aspx – Chemical Resistant Novolac Epoxy Coating. Doing an effective job of building secondary is easier than you may think. For more information visit our website at http://www.epoxy.com, call our technical support department at 352-533-2167 or email us at info@epoxy.com. If abrasive particles are present they should be removed by mopping with common household detergents and rinsed completely. Be sure not to use the detergent at a concentration higher than that recommended by the manufacturer of the floor cleaning material. Be sure to test any cleaner that you haven’t used before on a sample of the Seamless Flooring Material or Seamless Floor coating. You may want to be sure to prepare these samples as you are installing the floor so they will be available to you at a later time. Be sure to rinse off all chemical solutions that may attack the surface. All seamless flooring and floor coatings should be mopped on a regular bases with a neutral soap or detergent, and completely rinsed. Be sure not to use the detergent at a concentration higher than that recommended by the manufacturer of the floor cleaning material. Be sure to test any cleaner that you haven’t used before on a sample of the Seamless Flooring Material or Seamless Floor coating. Mop should be rinsed often. Synthetic mops tend to work better on textured surfaces than cotton mops. The water should be changed frequently as well. Smooth floors are easily cleaned this way. It may be necessary to give extra care to areas that are subject to heavy traffic, hard rubber wheels, and steel wheels that leave marks. In these situations you can use the methods used for textured floors for these more difficult to remove contamination. Grease is typically removed by Tri-sodium phosphate (TSP) or other commonly available biodegradable cleaner. Contact Epoxy.comTechnical Support Department with your specific questions. Dairy products should be removed immediately as they may cause staining on some types of seamless flooring and seamless floor coating systems. Scrub the area(s) with a stiff bristled brush and using the same biodegradable floor cleaner that you are using to mop with. When you are trying to remove stubborn dirt or stains,allow the biodegradable cleaner to set in the area for a little while longer and do the work for you. Then completely rinse to area to remove the cleaner and the dirt. You should always rinse strong chemicals as quickly as possible completely from the surface. Chemicals allowed to dry on the surface typically become more concentrated as they dry. That may cause the chemical to get concentrated enough to stain or even attack the seamless floor or seamless floor coating. 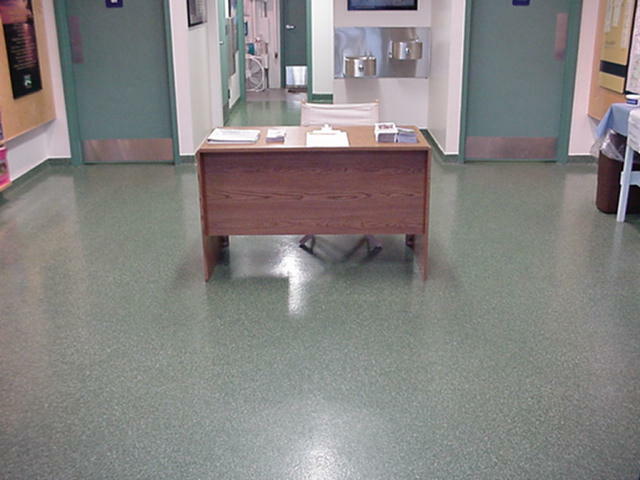 Epoxy.com Epoxy and Urethane Seamless Flooring and Seamless Floor Coating Systems are very shinny and so waxing or polishing are not necessary. If a floor is very old, or has seen extremely high traffic this shine may dull. If it does then you can wax or polish the floor with standard commercial products that are designed for that purpose. Better yet, if this happens, you may want to renew or refinish your system – see below. Consult with Epoxy.com Technical Support Department for the proper material to re-glaze you floor. Be sure to follow all directions for installing the re-glazing material. Norm Lambert > Thank you for pointing that out. You bring up an excellent question. Epoxy.com Products that are 100% solids (100% active ingredients) do not contain solvent, that means they have no VOCs making them compliant with the toughest Low VOC Standards. I will start updating pages on the Epoxy.com to reflect that in the future. Until then please rest assured that all Epoxy.com Products that are 100% solids have no VOCs in them. Epoxy.com Product #633 Novolac Epoxy Coating is installed basically in 3 Steps. Apply 1 coat of Epoxy.com Product #899 Primer at a rate of 250 to 300 SF per gallon per coat. Apply 2 coats of Epoxy.com Product #633 at a rate of 160 to 200 SF per gallon per coat. For the sake of simplicity the procedure for mixing and installing is mentioned once below because the three coats apply virtually the same way. Before you start you will want to read the following. Do with Epoxies – The things that you don’t want to forget to do when using epoxy. Don’ts with Epoxies – Don’t do any of these things when using epoxy. Surface Preparation – Surface preparation sets the foundation for your application. If you want your job to work better and last longer be sure to read and follow these steps. Be sure to mix both the A and the B sides of your material before starting. Be sure to use a clean stir stick or mixing paddle for both. Do not cross contaminate. Cove Base Installation – Epoxy Cove installation used to be very difficult to install. With Epoxy.com Products and this installation guide, this job is made much easier. When installing over concrete or wood you will first want to prime with Product #899 Epoxy Primer –www.epoxy.com/899.aspx. The purpose of this primer is to go on thin (250-300 square feet per gallon) and seal the floor so you do not get air or moisture coming up into your epoxy coating which will be going on thick (160-200 square feet per gallon). The 899 epoxy primer is also thinner than the coating and so it flows out better. Over stainless steel, aluminum and galvanized metal use Epoxy.com Product #660 Aluminum Filled for the primer. Be sure to properly protect the floor where you will be doing your mixing. Stir the Resin “A” and the Hardener “B ”each separately in their original container before measuring and mixing the two together. Be careful to use separate stir sticks so not to cross contaminate. Temperature of Epoxy.com Product #899 Primer and Epoxy.com Products #1, #2 and #633 must be 50 degrees F or above at time of mixing. Stir each component separately before blending. Mix two parts by volume of Part A with one part by volume of Part B for three minutes with a low speed electric drill motor equipped with a mixing paddle. Be sure the mixing paddle is large enough to mix the material completely. You will want to use a “propeller” type mixer with blades 5 inches or bigger. A 5 gallon metal pail or 5 gallon plastic pail makes a great mixing bucket. Always be sure that your mix bucket is clean and is not contaminated with anything before you mix. Some people like to use the two bucket method. That allows your person mixing to be mixing while your install people are installing the last bucket. If you start to show signs of your material hardening in the mix bucket, start using a new one. Typically you will want to use a paddle mixer, that goes into a low speed drill. Your drill mixer should be large enough to stir the entire batch at once. A mixer that only moves only the partial contents of the pail, may result in inadequate mixing. Be sure that you use a clean mixing paddle. A dirty mixing paddle can result in poor mixing or contamination of the batch. When mixing try not to whip any unnecessary air into your mix, by using the slowest drill speed and keeping the mixing paddle reasonably level. Carefully measure out the “A” resin and the “B” hardener into two other containers. Stir for 3 minutes, being sure to scrape the bottom and sides as you mix. If Anti-Skid Course or Anti-Skid Fine is to be used add 12-16 volume ounces per mixed gallon, and mix until properly dispersed, typically 1-2 minutes. • Trim around all the areas that are difficult to roll. • Remember not to get two far ahead, you don’t want the material to set up before it is broadcast. Epoxy.com Product #899 can be applied with a brush, roller or squeegee at a rate of 250-300 square feet per gallon. Remember that if you put it on too thick you can get bubbles in the 899 Epoxy Primer. The important thing is to completely wet out the concrete without leaving excessive material. Allow the 899 primer to cure until hard. Typically, 10-12 hours at 75 degrees F. Do not allow more than 24 hours between this coat and the coat of coating to follow it. Epoxy.com 899 Primer typically requires only 1 coat. The Epoxy.com Product #633 Novolac Epoxy Coating is typically applied at a rate of 160-200 SF per gallon per coat. Typically, 2 coats of Epoxy.com Product #633 High Chemical Resistance Epoxy are required. These coatings can be applied with the same tools as #899 Epoxy Prime. When Product #633 is applied over concrete or wood, prime with Product #899 Epoxy Primer and allow the Product #899 Primer to cure to tack free. Over stainless steel, aluminum and galvanized metal use Epoxy.com Product #660 Aluminum Filled for the primer. Be sure to install the 633 within 24 hours of the installation of the primer. For typical installations as a coating apply 2 coats of Product #633 Novolac Epoxy at a rate of 160-200 square feet per gallon per coat. This yields a wet film thickness of 8-10 mils thick per coat or 16 – 20 mils for the two coats. Since this is a 100% solids Resin and Hardener system, there is no loss during drying, so the wet film thickness and the dry film thickness for 2 coats will be identical (16-20 mils DFT). Be sure to install the second coat after the 1st coat is hard enough to walk on but before 24 hours after the installation of the previous coating. If Anti-Skid Fine or Anti-Skid Course epoxy anti-skid additive is used add plus or minus 12 volume ounces of Anti-Skid per mixed gallon of Product #633. Never add more than 16 volume ounces per gallon of Resin and Hardener mix. Step 3. Apply 2 coats of the appropriate Product #633 Highly Chemical Resistant Novolac Epoxy Coating. Add optional anti-skid if required. For additional help please contact Epoxy.com Technical Support at 352-533-2167 or email norm@epoxy.com. You are currently browsing the archives for the Novolac category.